For those who have installed the Method Sync Engine. 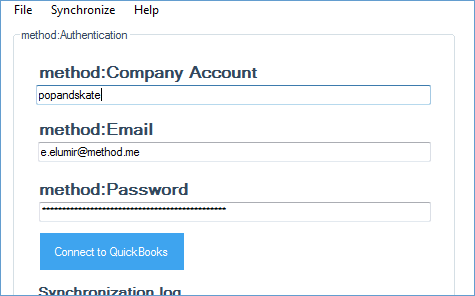 QuickBooks Desktop users will have the Method Sync Engine installed on their QuickBooks computer to facilitate the two-way sync between Method and QuickBooks. Authenticating with an Authorization code provides a secure way to connect Method to a trusted machine installed with the Method Sync Engine, without the need for account, email, or password. 1. Log in to Method. 2. Click the gear in the upper right hand corner and select Preferences. 3. Select QuickBooks on the left menu. 4. Select Troubleshooting to expand the troubleshooting section. 6. Underneath 2.Install, click Generate One. You can now paste this authorization code into the Method Sync Engine. For more information, jump below to Enter an Authorization Code. 3. Select Integrations on the left menu. 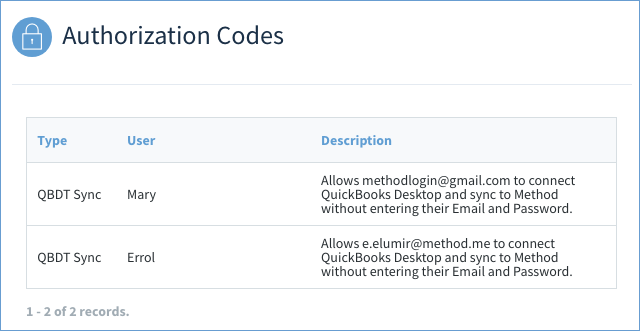 You can now paste this authorization code into the Method Sync Engine, as shown below. 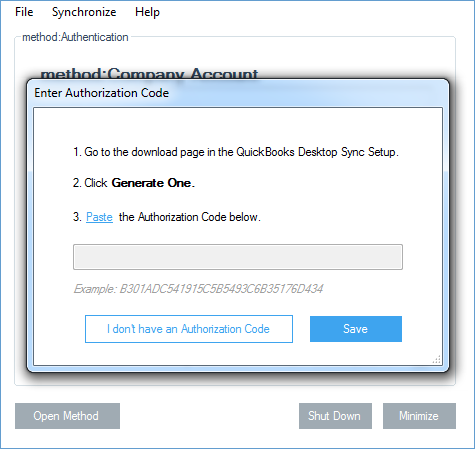 Once you have your Authorization Code and copied it into you clipboard, you will need to put it into the Method Sync Engine. 1. 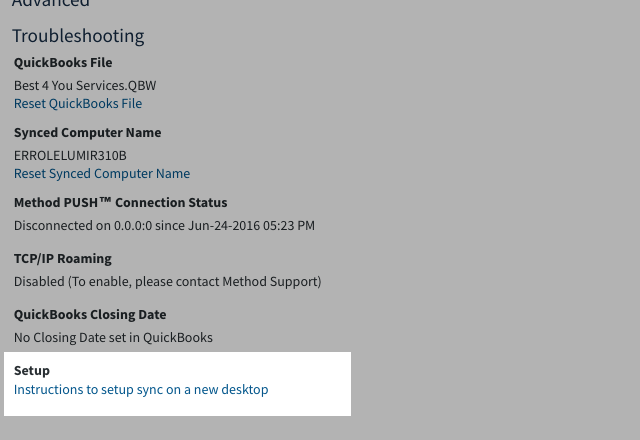 Go to your QuickBooks Desktop machine which has the Method Sync Engine installed. 2. 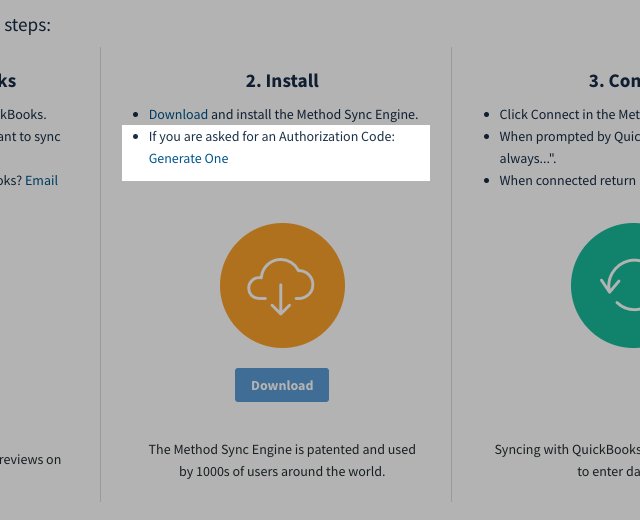 Launch the Method Sync Engine. If it's already running, find the Method Logo in your task bar, right-click it, and select Display. 6. 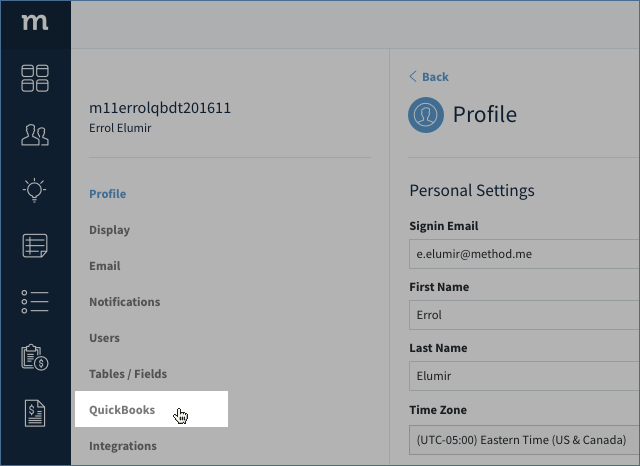 Click Connect to QuickBooks to start the Method Sync Engine. If you do not wish to use an authorization code, you can revoke it to ensure no one else can use it. Click the gear in the upper right hand corner and select Preferences. 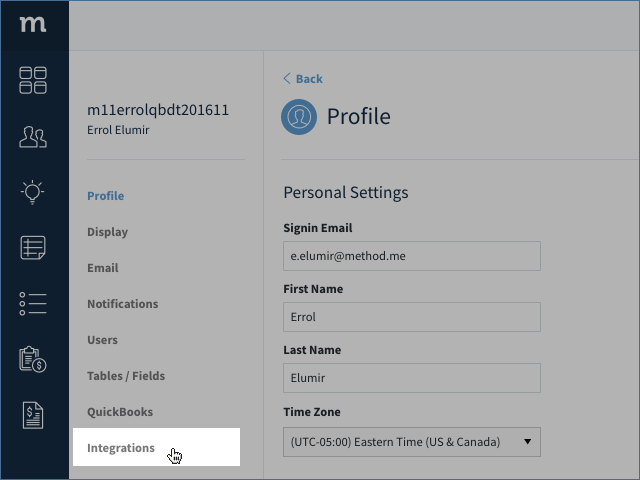 Select Integrations on the left menu. At the bottom, select Revoke.